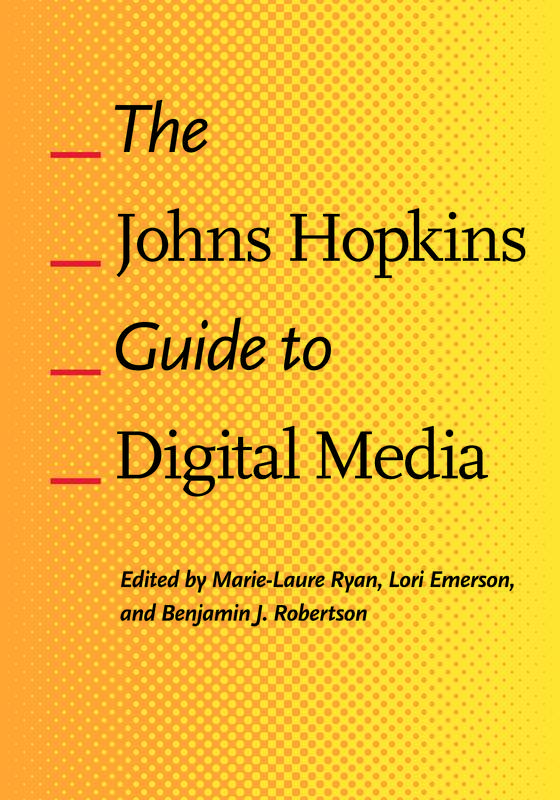 It has been a great honor to have the opportunity to edit the Johns Hopkins Guide to Digital Media (2014) with Marie-Laure Ryan and Benjamin Robertson. Our rationale for this guide was that the study of “digital media”—the cultural and artistic practices made possible by digital technology—has become one of the most vibrant areas of scholarly activity, and is rapidly turning into an established academic field, with many universities now offering it as a major. While a plethora of books have been published on the various cultural applications of digital technology, we still lack a systematic and comprehensive reference work to which teachers and students can quickly turn for reliable information on the key terms and concepts of the field. This book, then, presents an interdisciplinary panorama of the concepts, tools, and software that have allowed digital media to produce the most innovative intellectual, artistic and social practices of our time. Especially thrilling is the list of contributors and entries these top-notch scholars who wrote for this collection. Below is a list of these contributors and their entries (although I should note that there may be a few changes between now and publication).